Aiz teh moast important part!!! Wivout me, wud be no pikkynik! We hab us a freewai! 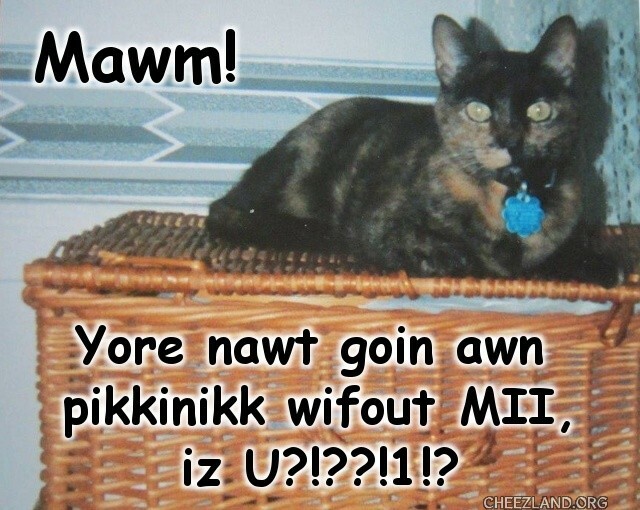 Wii izz going tu Princess Mew meddaow yes?! Wye u nawt pakkd teh toona? Adn mayk shoor it’z teh gud stuffs. Dass nawt fare – iz mai anniberseree 2! tribble grats awn teh trifecta! Louise issa berry beautimus kitteh! *nodnod* An berry sim… sum… lukks berry much lyk current kitteh, at that. Dunno hao her did that. Ohai pk. Wuz amiraclol dat. Z. 1ST KAWMINT AWN NOO FONE yayyayyayy. Hrrrrraaaaaayyy foar yoar noo foan!!! Ohai roofie yayyayyayy kermie armz nd xklammashun pointz. Ohai pk. Wuz a miraclol. Wvclaylady, Mizuki_chan85, Isengrim, _linin_, JohnnyK, mainlycoon, faeriella an evreewun else hoo haz a burfday today! i haz bringd yummy fudjy burfday caeks, buttery yellow caeks wif crunchy brown sugar topping, iskreem, fizzy frooty party punch, baloonz, an goodie bags filled wif yoyos that lite up wen they yoyo, sekrit decoder mood ringz, kandee, an woodland seens stikker coluring buks wif stikkers an boxes ob elebenty-4 crays (wif bilded-in sharperner)! an a big swish ob teh burfday wand to making all yor burfday wishes come troo! Oo! Adn happieth birfdae tew awlla birfingday peeps adn cheezland! Ohmai, lotsa birfdays fur teh nawt-sekkund day of annibirfary! Happeh happeh birfday, alla peeps!!!! happie burdie too teh burdie peeps! Happehphappiehappee annibirfarrie awl yew wunnermus cheezies! Twas a Sunny an nawt too hawt affernoon — jest purrrrrrrfect furr a lubberly pikkinik and sordid sillybrasuns furr a speshell annibirtharreh. Onna da war sum ub dem had trubblol cuz onna da rode der wuz a …..
Hugh manatee dat had mayd a rong tern adn was losted. So teh cheezpeeps gabe him a bloo bukkit, poynted him to teh o’shun adn sed he shud luuk for teh walrus. After dat, teh cheezpeeps luuked up ohai in teh aer adn saw. . .
stikked owt its pinky tung adn mayd dem awl splort. Meenwhilol, teh lolrus. . .
Leslie outta da sling aimin furr Hugh and hiz bukkit …. Aie due beleef dat iz MAI bloo bukkit!! Ai am so glad U fownded it at last. U haz mai many fanks. Heer am sum hallibutt foar the reewardz. adn kitteh eeted teh reewardz juss for teh hallibutt. An den da kitteh herded alla der hoomins bakk inna der kars (hoomins – sew EZilee distwakktid) sew dey cud karry onto da pikkinikk site. Ware dey spred owt teh pikkinikk blankitts adn opened teh pikkinikk baskits adn fownd inside . . .
Ai hazza baskit jus liek tihs taht ai yuze tu taek mai Ferdi tu teh v-e-t. (He izza big kitteh an teh baskit iz biggur n stronger tahn a konvenshunal karrier). Wun tiem, az ai wuz battlin fru a blizzerd (literally!) wif teh big kitteh in teh eben biggur baskit (n cubberd in sno mice elf) a passer-by (wiv a scents uv hyumer) kawld owt: “Awf tu a piknik, ar u? Kin ai come tu?”. Dat iz berry funneh!! I lub it wen randum peeps maek da kwazy funneh commint…. Fanku, Elsa Mama, n apololologees fur interruptin teh sunnee afternun storee – owr messijes krost in teh poast ! I finded a site that makes teh games, word searches an scramblols an fings, an started trying to make a puzzlol fur fun. But duing enny uv those wif a list uv wurds in lolspeek, when evreewun spells evreefing indi… indef… in tehir own wayz, it just nawt gonna wurk, aifinkso. Maebee yoo cud doo eet wiffy pet naems air maebee peeps names?